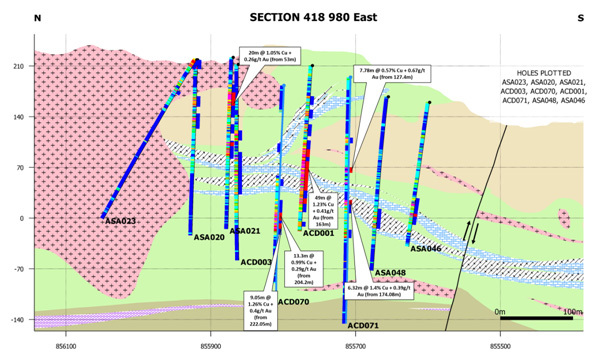 Cordoba Minerals Receives Additiona | Cordoba Minerals Corp.
TORONTO, ONTARIO, December 5, 2017: Cordoba Minerals Corp. (TSX-V:CDB; OTCQX:CDBMF) (“Cordoba” or the “Company”) is pleased to announce additional high-grade intercepts from the ongoing resource expansion diamond drilling at the Alacran Deposit, located within the 100%-owned San Matias copper-gold project in Colombia. Gold-rich zones at the Alacran Deposit are not only associated with copper in the replacive stratabound mineralization but also with two different styles of epithermal vein mineralization: (1) intermediate sulphidation or CBM (“carbonate base-metal”) style veining that has a sphalerite-gold association and (2) low sulphidation fault-veins where gold is associated with arsenopyrite with cobalt. 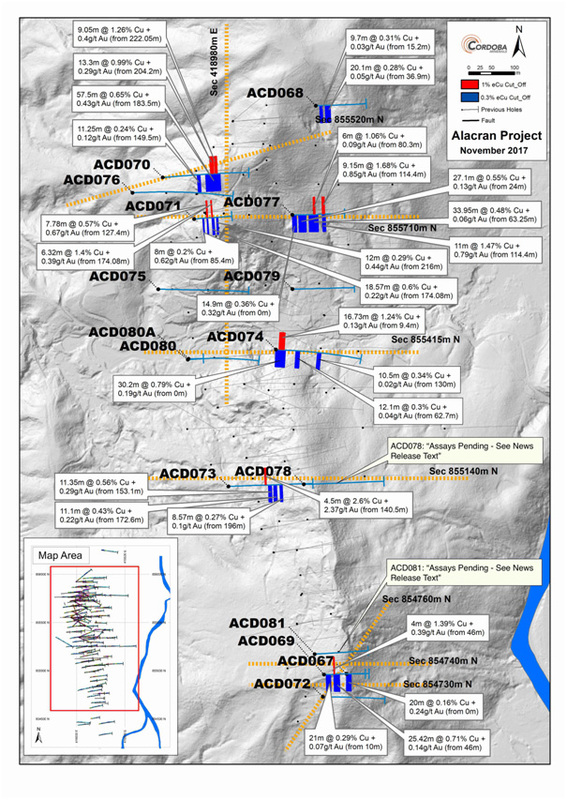 Both vein types are associated with strong carbonate-chlorite-white mica alteration and are interpreted to have occurred as part of a later geological event overprinting the stratabound manto-style copper-gold mineralization. 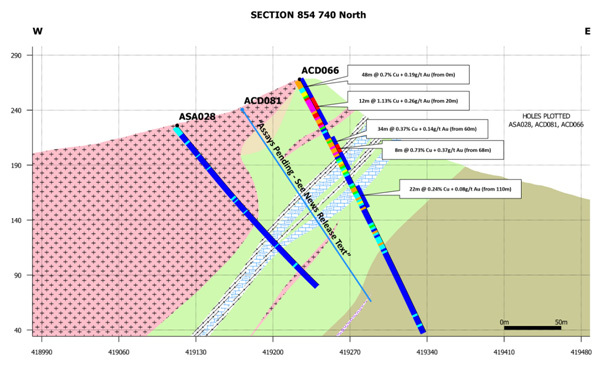 On Section 854740mN (Figure 5), hole ACD081 was drilled as a step back hole to extend 60 metres down-dip the high-grade intersected by ACD066 (48 metres @ 0.70% copper and 0.19 g/t gold; previously released in July 2017). 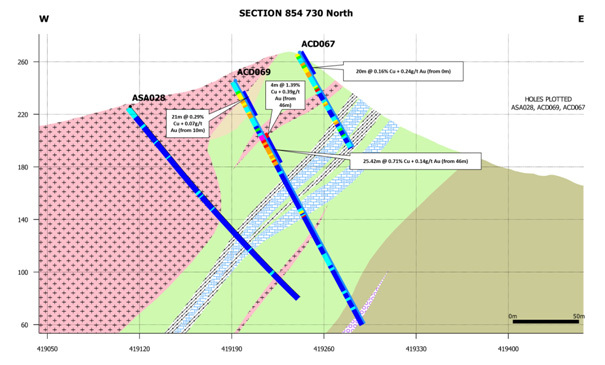 ACD066 was collared to test outcropping mineralization and an induced polarization (“IP”) anomaly identified 200 metres to the south of the Inferred Mineral Resource shell published in January 2017. 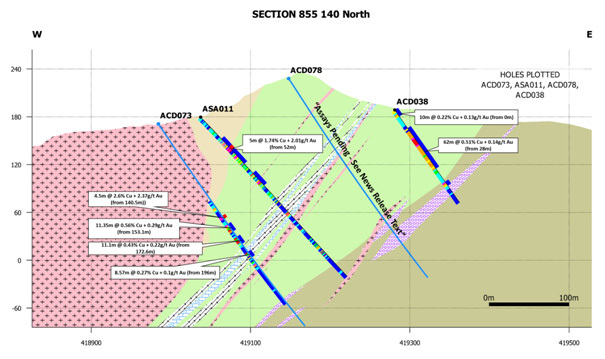 ACD081 has intersected the down-dip continuation of the same magnetite-chalcopyrite manto hosted in the laminated calcareous mudstones which are stratigraphically part of Unit 2. 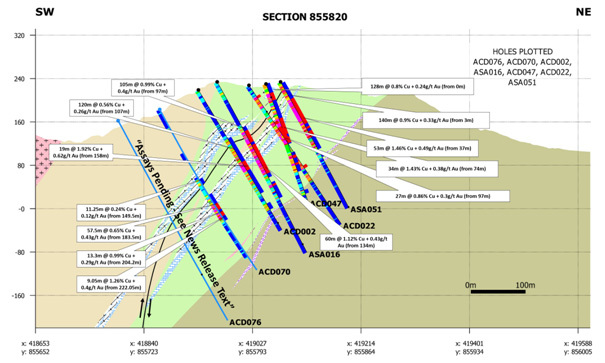 High grade mineralization is expected as shown in Figure 5. 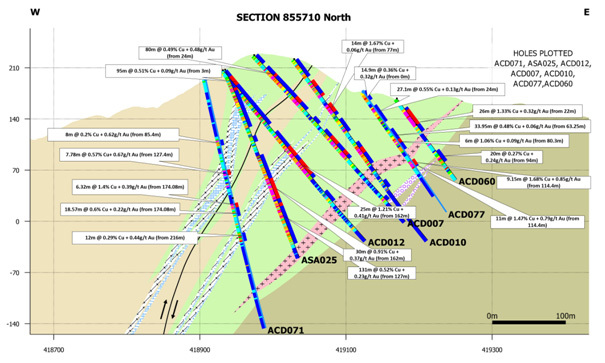 The Inferred Mineral Resources at Alacran are currently 53.5 million tonnes @ 0.70% copper and 0.37 g/t gold. 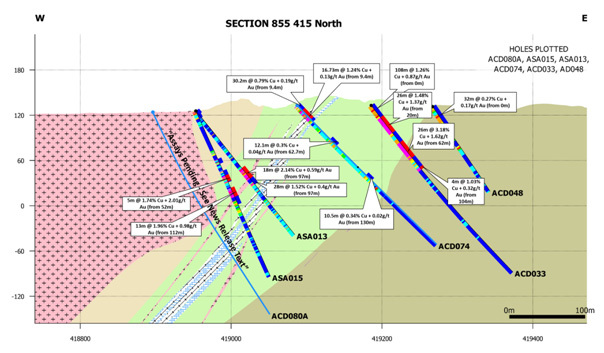 Alacran is approximately two kilometres southwest of the Company’s Montiel porphyry copper-gold discovery, where drilling intersected 101.1 metres @ 1.0% copper and 0.65 g/t gold (previously reported in DDH-004), and two kilometres northwest of the Costa Azul porphyry copper-gold discovery, where drilling intersected 86.6 metres @ 0.62% copper and 0.51 g/t gold (previously reported in CADDH003). This news release includes certain “forward-looking information” within the meaning of Canadian securities legislation. Forward-looking statements include predictions, projections and forecasts and are often, but not always, identified by the use of words such as “seek”, “anticipate”, “believe”, “plan”, “estimate”, "forecast", “expect”, "potential", "project", "target", "schedule", budget" and “intend” and statements that an event or result “may”, “will”, “should”, “could” or “might” occur or be achieved and other similar expressions and includes the negatives thereof. Forward-looking statements include, without limitation, (i) that recent results represent significant potential to extend and increase the scale of the current mineralized resource; and (ii) that an updated resource estimate will be completed in Q1 2018. Forward-looking statements are based on a number of assumptions and estimates that, while considered reasonable by management based on the business and markets in which Cordoba operates, are inherently subject to significant operational, economic, and competitive uncertainties and contingencies. All statements other than statements of historical fact included in this release, including, without limitation, statements regarding the potential of the Company’s properties are forward-looking statements that involve various risks and uncertainties. There can be no assurance that such statements will prove to be accurate and actual results and future events could differ materially from those anticipated in such statements. Forward-looking statements are based on a number of material factors and assumptions. 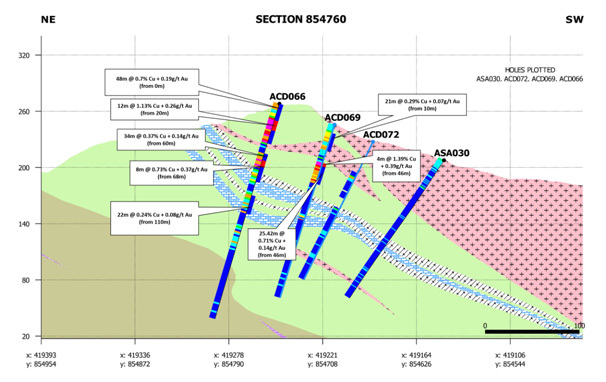 Important factors that could cause actual results to differ materially from Company’s expectations include actual exploration results, changes in project parameters as plans continue to be refined, future metal prices, availability of capital and financing on acceptable terms, general economic, market or business conditions, uninsured risks, regulatory changes, delays or inability to receive required approvals, and other exploration or other risks detailed herein and from time to time in the filings made by the Company with securities regulators. Although the Company has attempted to identify important factors that could cause actual actions, events or results to differ from those described in forward-looking statements, there may be other factors that cause such actions, events or results to differ materially from those anticipated. There can be no assurance that forward-looking statements will prove to be accurate and accordingly readers are cautioned not to place undue reliance on forward-looking statements which speak only as of the date of this news release. The Company disclaims any intention or obligation, except to the extent required by law, to update or revise any forward-looking statements, whether as a result of new information, future events or otherwise. Copper equivalent (“CuEq”) calculations assume a US$2.50/lb copper price and a US$1,300/Oz gold price.